Sepia tones: Civil War Enactment. I am still not sure what the standard color tone is for Sepia. I have on quite dark and the other one lighter. Could someone tell me if i went from one extreme to the other? Should the color be somewhere in the middle? Just some background. I took this picture while I was in Virginia, USA during a civil war reenactment. I showed my "sweety" this picture and told him I thought it was too grainy (picture #2), but he said it gives it an "old" look. Therefore, I thought I would make the picture 100 years old, and this is what it looks like...your thoughts are welcome! I'll try it again and repost. Wow Ann, I love this last one, it really does look like an old phot o.
excellent Ann, in my minds eye i was thinking a bit darker than your new edit but i think you've hit the nail on the head, it's perfect!! Wow Ann that is fabulous! You MUST show that one at the fair!!! I really thought it was from that time period! 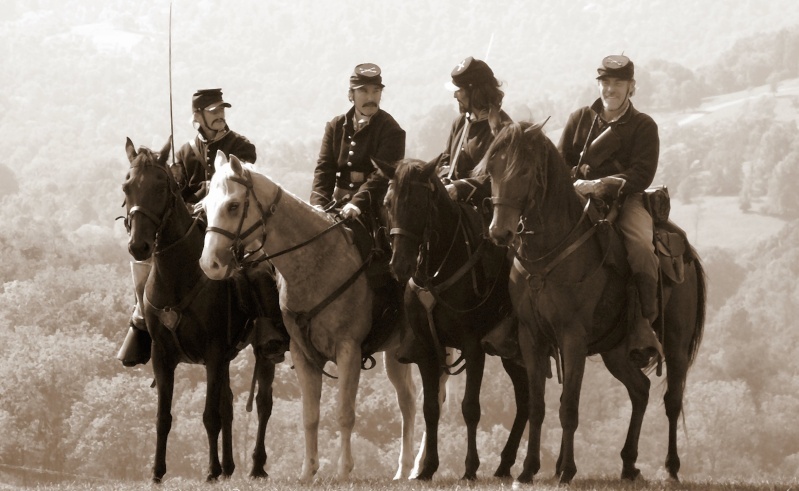 I have a friend who use to do Civil War reenactment. He was a civilian photographer and did tin type photography. Your first picture is probably closest to original but, I like #3 better. also they are both too clean, they need to have more grain if you're looking authenticity. Well done, love the rework on it. simply brilliant picture!! it would look more authentic with the 'torn edged' look if you have it in your editing software? ahh yes!! thats what i had in mind!! looks great!! Lol... well thank you! Priscilla and I are getting ready for the county fair, so we are trying to decide how to present some of these pictures. I will probably enter this, but I dont think I will be able to put the torn picture behind the matting...unless..any of you have seen it done behind matting before with this type of technique. My disadvantage is that I have not observed the fair before...so this will all be new! Subject: Re: Sepia tones: Civil War Enactment.